Dryers are commonly classified on the basis of the predominant method of transferring heat to the wet solids being dried. These methods are convection (direct drying), conduction (indirect drying), radiation (infrared drying), or a combination of these. In convection (direct drying), heat transfer is accomplished by direct contact between the wet sludge and hot gases. The heat of the inlet gas provides the latent heat required for evaporating the liquid from the sludge. The vaporized liquid is carried by the hot gases. Under equilibrium conditions of constant-rate drying, mass transfer is proportional to (1) the area of wetted surface exposed, (2) the difference between the water content of the drying air and saturation humidity at the wet-bulb temperature of the sludge-air interface, and (3) other factors, such as velocity and turbulence of drying air expressed as a mass transfer coefficient (Metcalf & Eddy, 2003). Direct dryers are the most common type used in thermal drying of sludge. Flash dryers, direct rotary dryers, and fluidized-bed dryers employ this method. In conduction (indirect drying), heat transfer is accomplished by contact of the wet sludge solids with hot surfaces. A metal wall separates the sludge and the heating medium (usually, steam or oil). The vaporized liquid is removed independent of the heating medium. Indirect dryers for drying municipal sludge include horizontal paddle, hollow-flight or disk dryers, and vertical indirect dryers. In radiation (infrared or radiant heat drying), heat transfer is accomplished by radiant energy supplied by electric resistance elements, gas-fired incandescent refractories, or infrared lamps. An example of a radiant heat dryer is the multiple-hearth furnace, commonly used for the incineration of sludge. Thermal drying is preceded by dewatering of the sludge, usually by mechanical means. It is an important pretreatment step because it reduces the volume of water that must be removed in the dryer. Water in the dewa-tered sludge is evaporated in the dryer without destroying the organic matter in the sludge solids. This means that the solids temperature must be kept between 60 and 93°C (140 and 200°F). A portion of the dried sludge is often blended with the raw dewatered sludge feed to the dryer. This makes the drying operation more efficient by reducing agglomeration and thus exposing a greater solids surface area to the drying medium. Dried sludge and exhaust gases are separated in the dryer itself or in a cyclone, or both. The gas stream is exhausted through a pollution control system for removal of odors and particulates. Flash Dryer Flash drying is the rapid removal of moisture by spraying or injecting the sludge into a hot gas stream. 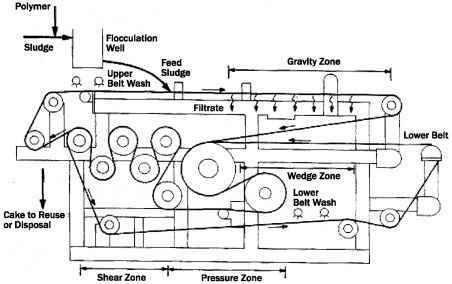 In a flash drying system (see Figure 8.1) the wet sludge cake is blended with previously dried sludge in a mixture to improve pneumatic conveyance. The blended sludge and hot gases from the furnace at 704°C (1300°F) are mixed ahead of a cage mill, and flashing of the water vapor begins. Gas velocities on the order of 20 to 30 m/s (65 to 100 ft/sec) are used. The cage mill mechanically agitates the sludge-gas mixture, and drying is virtually complete by the time the sludge leaves the cage mill, with a mean residence time of a few seconds. The dried sludge is conveyed to a cyclone pneumatically. The sludge at this stage has moisture content of only 8 to 10%. The sludge is then separated from the spent drying gases in the cyclone. The temperature of the dried sludge is about 71°C (160°F) and that of the exhaust gas is 104 to 149°C (220 to 300°F). Figure 8.1 Schematic of a flash drying system. destroyed when the temperature of the gas from the cyclone is elevated in the deodorizing preheater. Part of the heat absorbed is recovered in the combustion air preheater. The gas then passes through a scrubber to remove dust and discharges to the atmosphere. Although approximately 50 municipal flash dryer facilities have been installed in the United States since the 1940s, only five or six are still in operation (WEF, 1998). Most of these flash dryers were shut down because of high energy and operation and maintenance costs. Today, other types of dryers are preferred over flash dryers. Figure 8.2 Rotating dryer system. equipped with fins of various types. To break up and mix the sludge, there are also chains freely suspended at the beginning and at the end of the drum. The chains prevent the sludge from sticking to the walls at the beginning of the dryer, intensify the sludge drying process, and avoid the necessity of having a dry sludge crusher in the system. 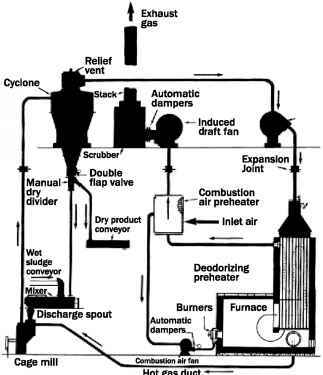 Auxiliary components of drum dryer system include a mixer for blending raw dewatered sludge and recycled dry sludge, a drum feeding screw, a furnace with a fuel burner for heating the air, a cyclone and scrubber for separating particulates from the hot exhaust gases, a heat exchanger, a dried sludge extraction screw, and a storage silo. Drying systems with either direct or indirect rotary dryers are available. Various models from one manufacturer are available with evaporation capacities from 1000 to 10,000 kg/h (2200 to 22,000 lb/hr) for direct dryers and with evaporation capacities from 350 to 2000 kg/h (770 to 4400 lb/hr) for indirect dryers. A rotary drying system is in operation at the Morris Forman wastewater treatment plant in Louisville, Kentucky. Primary sludge is anaerobically digested first and then blended with thickened waste activated sludge. The sludge mixture is then dewatered in centrifuges to about 26% solids and fed into four drying trains, each comprising a rotary drum dryer. Each dryer is sized to evaporate water from dewatered sludge at a rate of 8500 kg/h (18,700 lb/ hr). Total installed evaporative capacity is 34 metric tons/h (75,000 lb/hr). The methane generated from the digesters provides half of the energy required by the dryers. Heat recovered from the dryers is used to heat the anaerobic digesters (Shimp and Childress, 2002). Fluidized-Bed Dryer The fluidized-bed dryer consists of a stationary vertical chamber with a perforated bottom through which hot gases (usually air or steam) are forced. 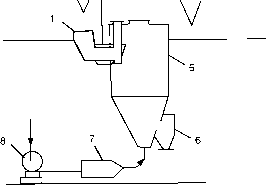 The flow schematic of a system for drying sludge in a fluidized-bed dryer is shown in Figure 8.3. 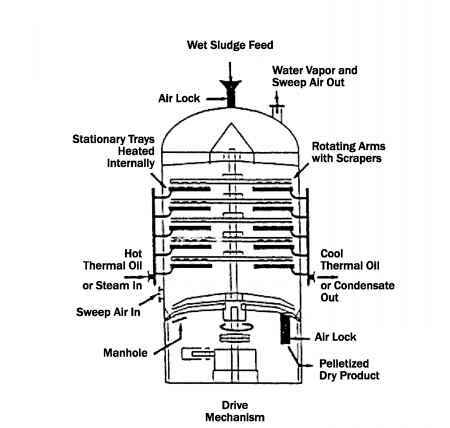 The dewatered sludge from the hopper enters the cylindrical dryer by means of a feeder. The air and the furnace gases, under pressure created by the high-pressure ventilator, pass through the gas distribution grate and create a fluidized bed of drying sludge and inert materials. The dried sludge is discharged in the forms of granules over a baffle of adjustable height into the dry sludge hopper. The dust fractions present in the spent gases are recovered in the cyclone and go to the sludge feed hopper. Then the gases go to the wet scrubber, where they are purified, partially cooled, and vented to the atmosphere through the stack by the ventilator. 1 - Dewatered sludge hopper, 2 - Cyclone, 3 - Wet scrubber, 4 - Discharge ventilator (exhaust), 5 - Cylindrical dryer, 6 - Dry sludge discharge hopper, 7 - Furnace, 8 - High pressure ventilator (air blower). 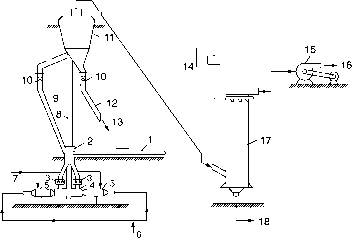 Figure 8.3 Schematic of a fluidized-bed drying system. between 300 and 900°C (572 and 1652°F) and gas temperature in the combustion chamber is 800 to 1100°C (1472 to 2012°F). Heating to such high temperatures requires a large amount of energy; therefore, thermal drying needs an energy recovery device. The principal advantages of fluidized-bed dryers are the ability of controlling the sludge drying time and the intensity of the heat transfer, the absence of moving parts, and the simplicity of design. A disadvantage is that the dust content of the exhaust gases is high, which is approximately 0.6 to 0.7 g/m3. Opposing Jet Dryer The opposing jet dryer is a dryer developed in Russia (Turovsky, 1998). It is a two-stage device (see Figure 8.4), the lower stage of which has the sludge drying chamber with the opposing jet element and the upper stage has the product/air handling device. After dewatering, the sludge cake is conveyed by a belt conveyor and then by double shaft screw feeders to the opposing jet element. The element is designed in the form of two horizontal jet pipes inserted coaxially in a standpipe. The drying scheme includes the recycling of fine dried particles to the sludge feed and discharge of the dried product from the air spout device. The sludge cake is mixed with a portion of the dried sludge in the double-shaft auger feeders, making the dryer feed homogeneous in composition and moisture content and intensifying the drying process. The airflow separator in the second stage increases the time of contact of the drying agent with the sludge. In addition, the dried sludge is classified in it by fractions. The drying method in opposing jet dryers involves the formation of gaseous suspension of the sludge particles in the hot gas flow. The process is very effective, due to the vibratory motion generated by the collision of the jets. This leads to an increase in the sludge concentration in the drying zone. At sufficiently high velocities of the drying agent, the sludge is pulverized so that the total heat and mass transfer surface area are increased. Operating parameters of opposing jet dryers are listed in Table 8.2. II - Airflow separator, 12 - Dry sludge pipe, 13 - Dry sludge feed to final product hopper, 14 - Water supply, 15 - Ventilator, 16 - Purified gases to atmosphere, 17 - Water scrubber, 18 - Sludge discharge. Figure 8.4 Schematic of opposing jet dryer. Horizontal Indirect Dryer Horizontal indirect dryers for drying municipal wastewater sludge include the paddle dryer, hollow-flight dryer, and disk dryer. Figure 8.5 is a schematic diagram of a horizontal indirect dryer. The dryer consists of a horizontal jacked vessel with one or two rotating shafts fitted with paddles, flights, or disks which agitate and transport the sludge through the dryer. The heat transfer medium (usually, steam) circulates through the jacketed shell and through the hollow-core shafts and hollow agitators (paddles, flights, or disks). A weir at the discharge end of the dryer ensures complete submergence of the heat transfer surface in the material being dried. The steam is discharged as condensate after transferring its available energy to the sludge. Dryers that use hot water or oil as the heat transfer medium are constructed internally in a manner different from those required for steam. Dewatered sludge is fed into the vessel continuously, with or without mixing with any recycled dried product. The transfer of heat from the heat transfer medium raises the temperature of the sludge and evaporates the water from the sludge solids surface. The water evaporated is transported out of the dryer by low-volume sweep gases or exhaust vapors. Figure 8.5 Flow schematic of horizontal indirect dryer system. power to turn the agitator shafts to break up the clumps. Horizontal indirect dryers are capable of drying sludge with less than 10% moisture. Vertical Indirect Dryer A vertical indirect dryer, such as the Pelletech dryer shown in Figure 8.6, dries and pelletizes sludge simultaneously. It is a vertically oriented multistage unit that uses steam or thermal oil in a closed loop as the heat transfer medium to achieve a dry solids content of 90% or more. Dewatered sludge cake blended with dried product is fed at the top inlet of the dryer. The dryer is equipped with several trays heated by the heat transfer medium. The dryer has a central shaft with attached rotating arms. The rotating arms are equipped with adjustable scrapers that move and tumble the sludge in thin layers from one tray to another in a rotating zigzag motion until it exists at the bottom as a dried pelletized product. 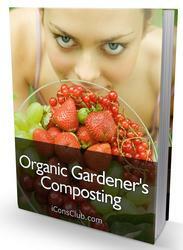 The process minimizes the formation of dust and oversized chunks. The dryer's exhaust consists of water vapor, air, and some pollutants. After the water vapor is condensed, only a small amount of gases, mainly moist air, remains to be treated. These gases are vented from the dryer to an odor control unit for thermal destruction of odor-causing compounds. The wastewater treatment plant in Largo, Florida, produces pelletized biosolids. The system includes aerobic digestion of primary and thickened waste activated sludge, dewatering on belt filter presses, a parallel two-train heat drying/palletizing system, product storage silos, energy recovery afterburners for process air, and a wet scrubber to control odor from a covered gravity thickener and drying building air. The thermal drying process reduces the moisture content of dewatered sludge cake from 85% to about 8% in the pelletized biosolids. In 2001, the facility produced dried biosolids at an average rate of 0.53 dry ton per hour at a net operating cost of $254.50 per dry ton. The dried product was sold for $38 per dry ton (Craven et al., 2004).